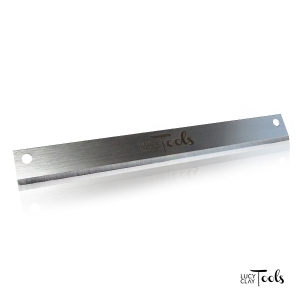 LC Mini Slicer is a tool designed for cutting or slicing polymer clay. Due to its compact size, Minislicer is very useful if you are not working in your studio/at home and need a compact yet precise cutting tool that you could take with you anywhere. It allows you to cut very thin slices of polymer clay with minimal distortion and is an indispensable tool for Hidden Magic (Mocume Gane) technique. LC Mini Slicer redesign 2019 is an updated version of our bestseller Minislicer. It is delivered as a toolkit and needs to be assembled - DIY. In a few simple steps, anybody can put it together and start slicing polymer clay. I will really like my new Lucy mini slicer. It’s very compact and easy to use. It slices even slices beautifully and precisely. I recently took mine to a retreat and everyone really liked it. It was easy to put together. Watching the videos really helped and the instructions were clear. I was tempted to buy the old mini slicer version a few months ago but by the time I decided to go ahead it was out of stock so when I saw the new design with the couple of offers I bought it straightaway. I am so glad I did! It is a fantastic piece of kit. I never did a lot of cane work before mainly because I found it difficult to cut even slices and ended up wasting half the cane. I know this is going to change now. I have done a few projects and I've used the canes all the way to the end. The new system to move the platform forwards with the screw is perfect and I get consistent thin slices every time. This is a fantastic product which I wholeheartedly recommend. So far I'm not sure I will keep this slicer. The cuts are not always accurate. Also, I don't think it is so sturdy. The blade has to be helped down or it hits in the wrong place. Anyway, I will keep trying it ... maybe i"m doing something wrong? Video #687: This smaller cousin of the original LC Slicer, is a great choice for those who don’t need all the features of the larger unit. Today I will be demoing the brand new LC Mini Slicer by Lucy Clay Tools, a company based out of the Czech Republic. This European styled slicer, is designed to evenly cut small to medium sized, unbaked polymer clay canes. It’s much smaller than the regular LC Slicer, and is less than half the price. So it is well suited for those who work with smaller canes… have less storage space… want more portability… or simply just can’t afford the larger model. 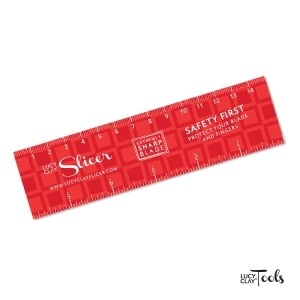 This tool is sturdy and well designed, though not quite as precise or as versatile as the larger unit. The LC Mini Slicer is currently only available direct from the manufacturer (see link below video), but will be eventually be made available through the other regional distributors at some point. It is good quality and a very useful product to have in your studio.